A long day for all but so much experience gained. 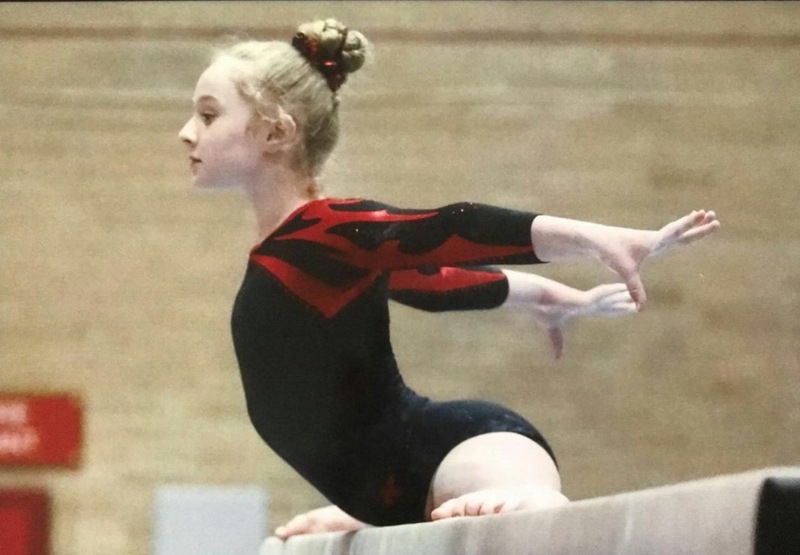 Romilly competed in the 2011 category performing in her first Yorkshire competition. 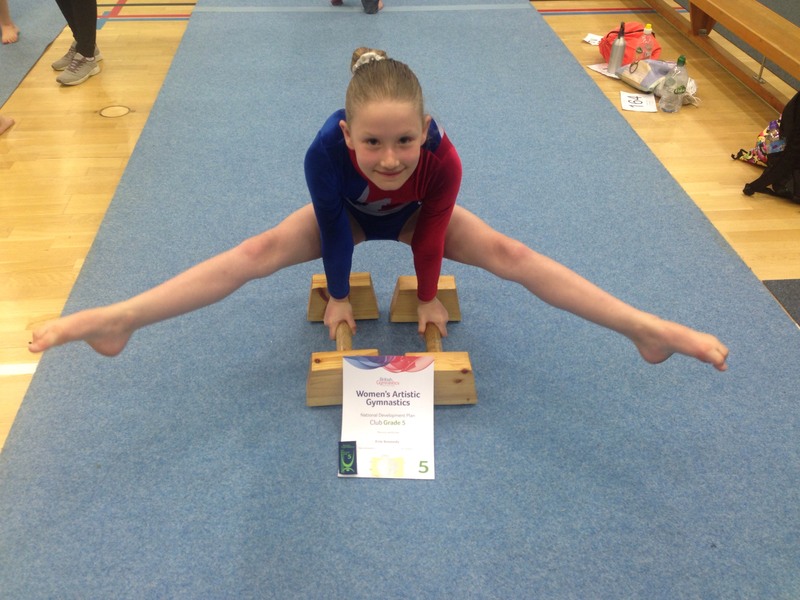 Romilly loved competing so much she performed an extra back hip circle on bars and additional forward roll on floor. Gaining a huge amount of experience from the event. Maisie also competed in the 2011 category performing in her first Yorkshire competition without mistake. Placing a wonderful 4th placed overall and receiving the pink ribbon. Placing 4th on vault and 7th on beam. India competed in the 2009 category performing in her first Yorkshire competition without mistake. Placing 11th overall, 5th on the bars and 7th on the beam. Ella competed in the 2010 category performing without error. Placing 19th overall. Juliette competed in the 2010 category performing in her first Yorkshire competition without mistake. Placing 7th overall, champion on bars and 5th on the floor. Harriet competed in the 2008 category performing without error placing 19th overall. Poppy competed in the 2007 category performing without error placing 10th overall, 5th bars, 5th on beam, and 6th floor. An excellent mornings work. Thank you to Nichola and Sharon for judging and Mrs Nobbs for keeping the competition running so smoothly. Under 8 – Ella only joined Wetherby at Christmas and performed without large error to pass with commendation. 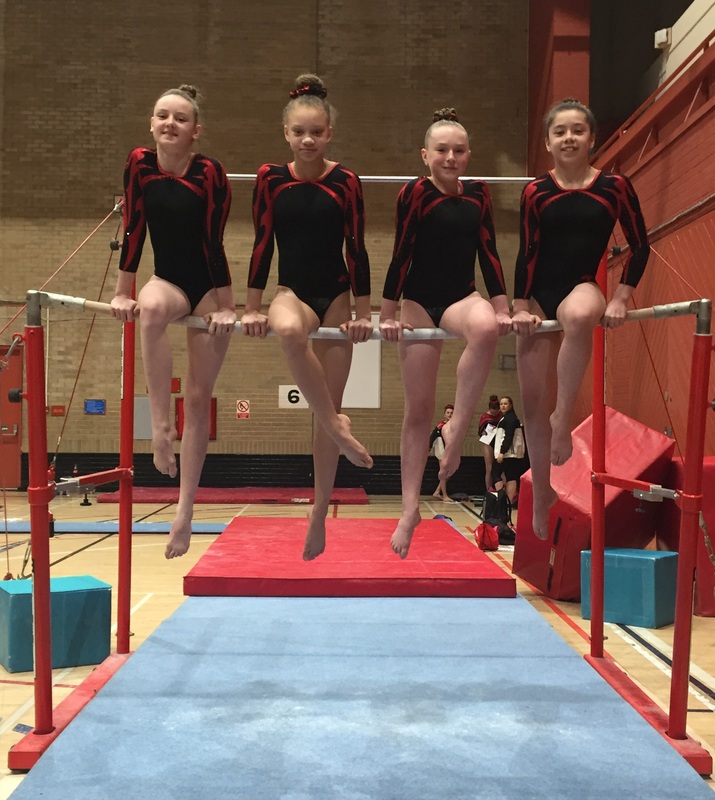 Achieving distinction on Vault, Bars and Beam. 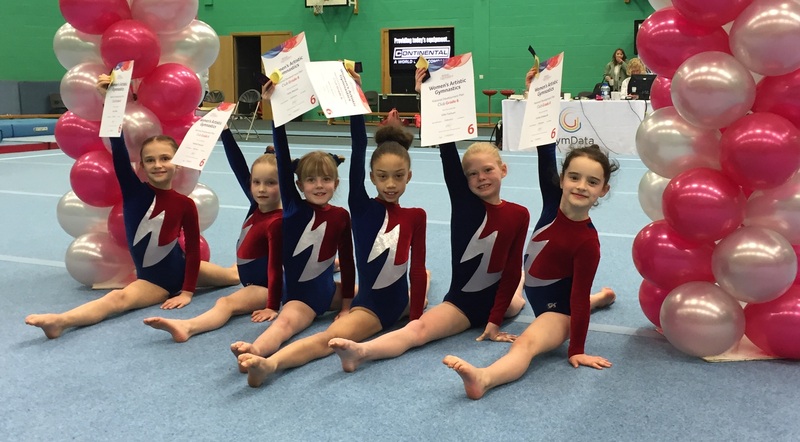 Under 9 – Lucy passed with distinction receiving the ribbon for 6th place overall. She achieved the highest score on conditioning for her age group. Katie passed with distinction receiving the ribbon for 5th place overall. Mia passed with distinction and performed with a smile and no mistakes. Chloe passed with commendation with distinction on vault and conditioning. 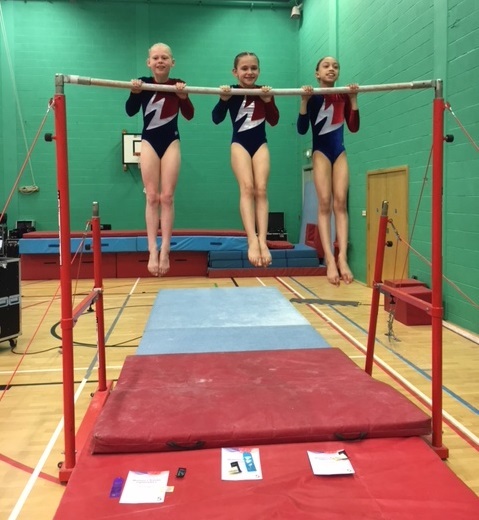 Lulu – passed with commendation with distinction on Vault, Bars and Beam. Achieving the highest score on vault for her age group. Lily-mae – passed with commendation with distinction on conditioning. Working hard to achieve her chin up circle up on the bars. Well done. Under 11 – Anna passed with distinction receiving the ribbon for 4th place overall. 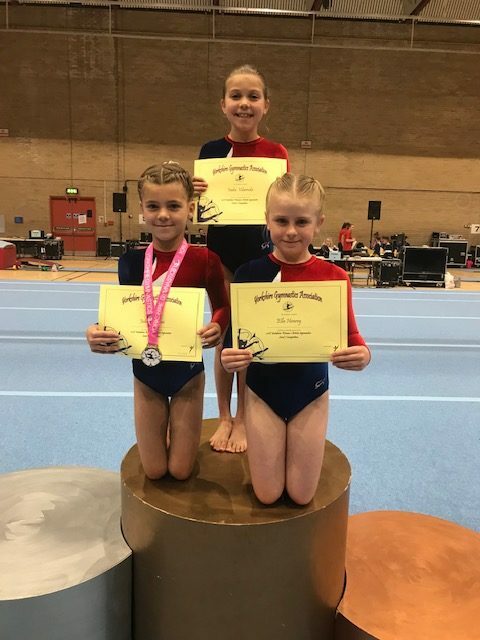 Under 9 – Evie passed with commendation with distinction on Vault, Floor and conditioning. 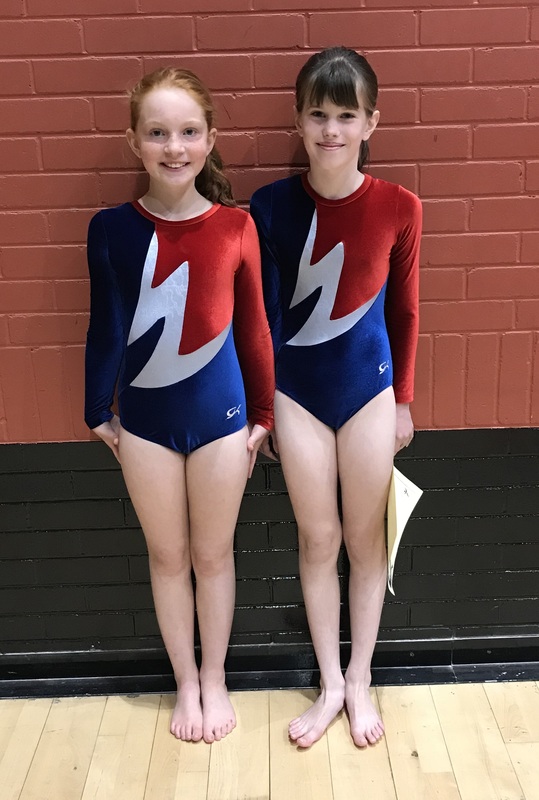 Naomi passed with commendation with distinction on vault, floor and conditioning. Placing 8th overall. 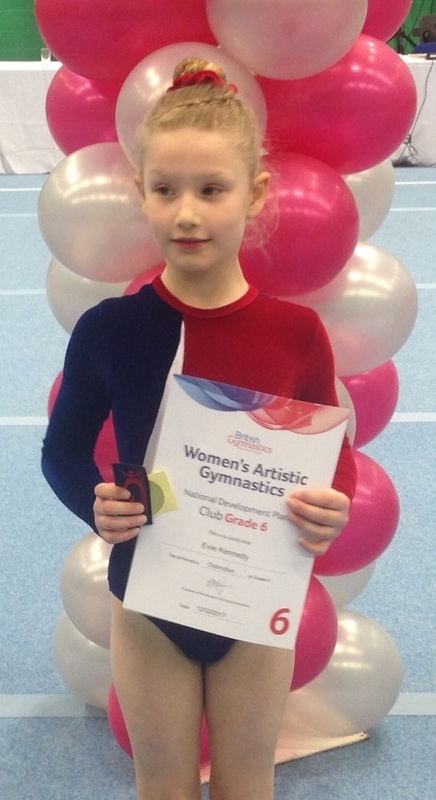 Ellie passed with commendation with distinction on vault, floor and conditioning. Placing 6th overall and receiving a ribbon. 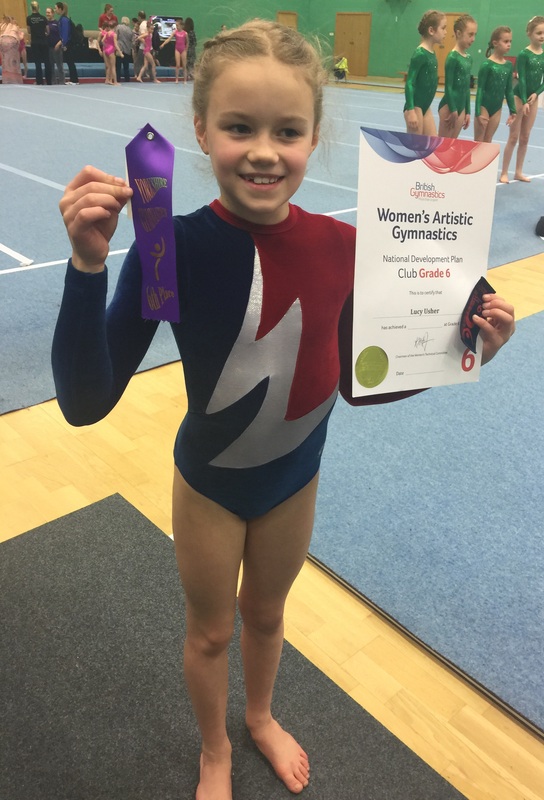 Libby passed with commendation with distinction on vault, floor and conditioning. Placing 5th overall and receiving a ribbon. 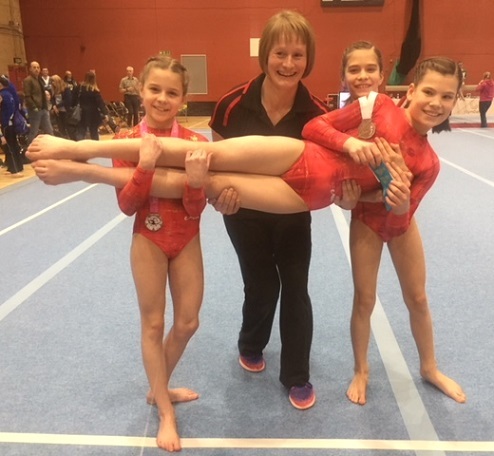 Our thanks go to Mrs Nobbs as the personal coach to 10 of these gymnasts and for keeping the competition running smoothly. Thank you also to Sharon and Nichola for the judging Marathon on the Saturday! 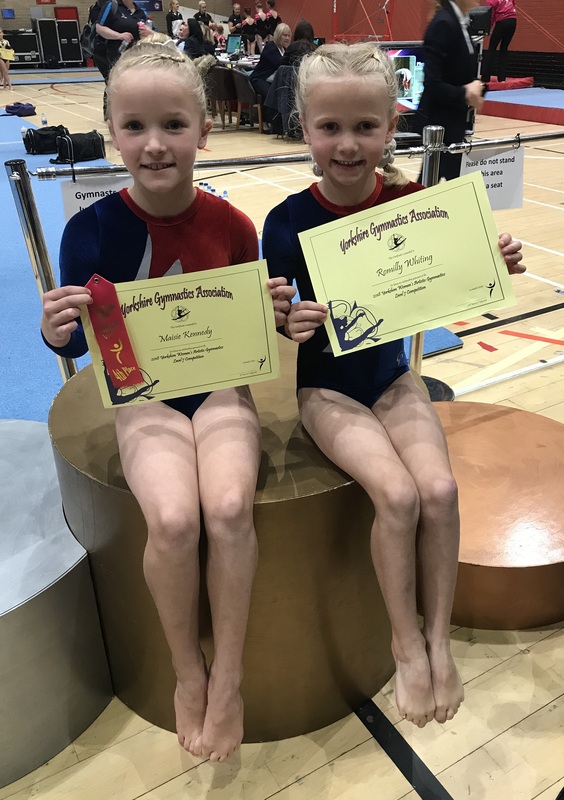 National Grade 4 – Matilda and Faith worked hard to pass with commendation. Matilda placed 6th on the Vault sticking her landing. 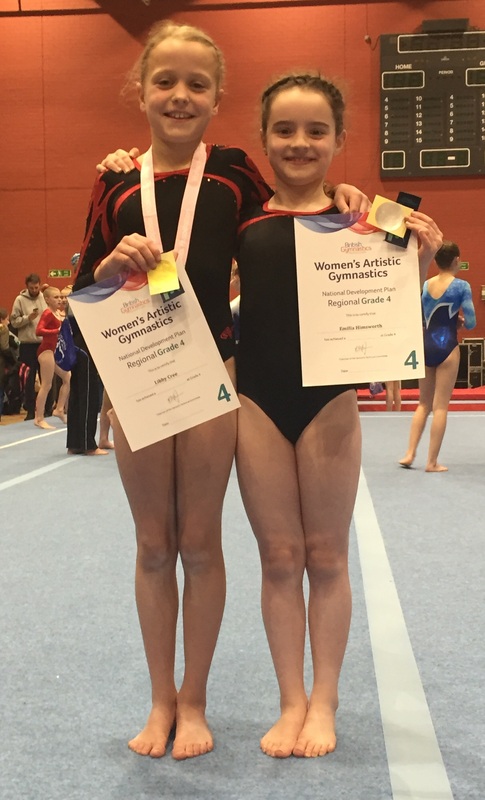 Regional Grade 2 – both gymnasts passed with commendation.Grace placed 4th on Bars and 6th on Floor. Narrowly missing an overall ribbon placing 7th overall. 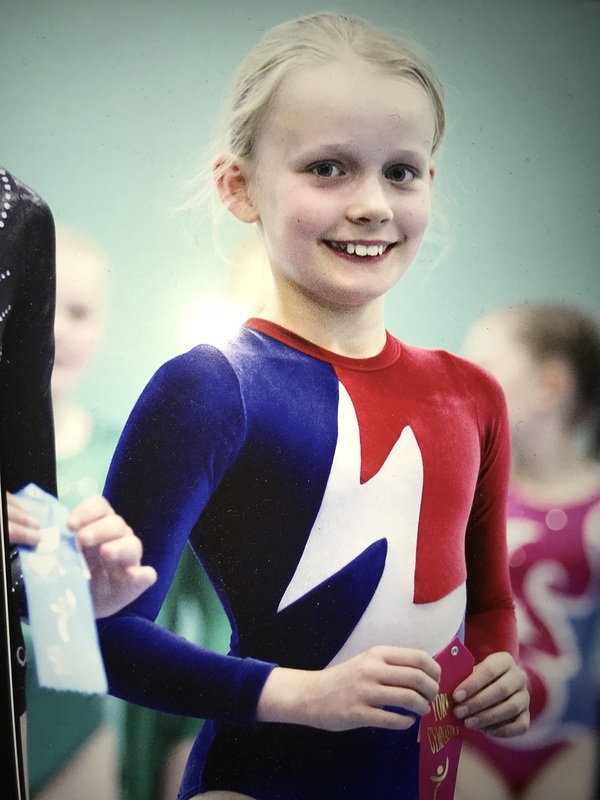 Eleanor placed 9th overall performing with courage and self belief after injuring her knee in training less than 48hours before the competition. Achieving a score of 13.1 on conditioning which no one was able to beat. Emilia has made excellent progress to pass with commendation. Only a free roll stood between her and distinction. Performing her first somersault off the Beam and overcoming the table Vault. Libby passed with distinction and achieved the bronze medal overall. Performing without any large errors. Placing 5th on Vault, 4th on Beam, 9th on conditioning. Rock Steady Libby! Molly has been very focused over the last few weeks of training. Mastering her triple flic on Floor and her back somersault off the Beam. Molly passed with commendation, an excellent personal achievement. 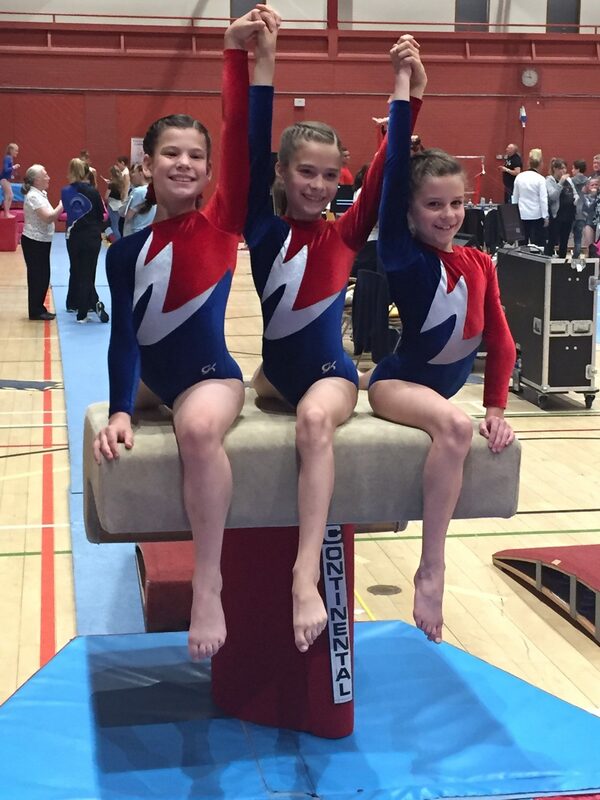 From the moment these 3 gymnasts lined up for the warm up they meant business. Warming up with complete focus, sharp and tight hitting the positions with pride. 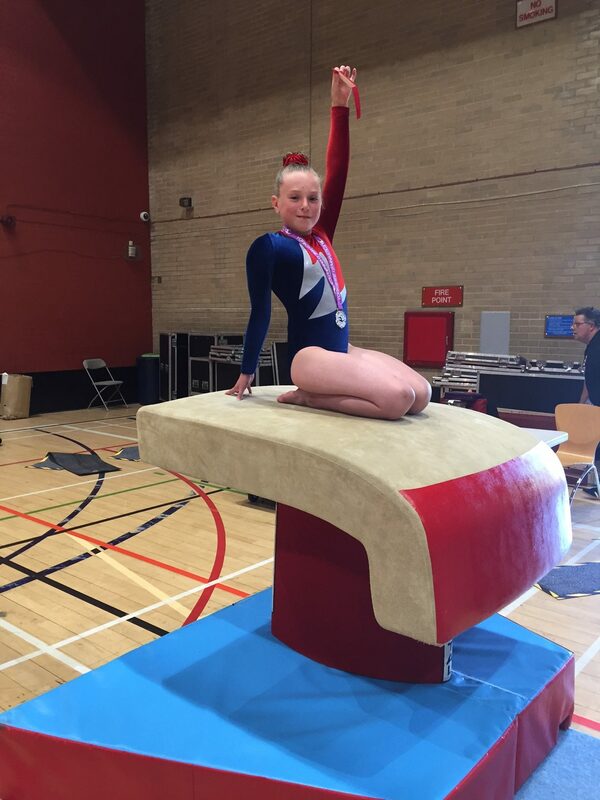 Emily placed 1st overall winning the gold medal and title of Regional Grade 4 Yorkshire Champion. Placing 1st on Vault, 9th on Bars, 2nd on Beam, 7th on Floor, 2nd on Conditioning. Sophie placed 3rd overall winning the bronze medal. Placing 3rd on Bars, 5th on Beam, 3rd on Floor, 7th on Conditioning. Charlotte placed 5th overall winning the turquoise ribbon. Placing 1st on Bars, 7th on Beam, 3rd on Conditioning. 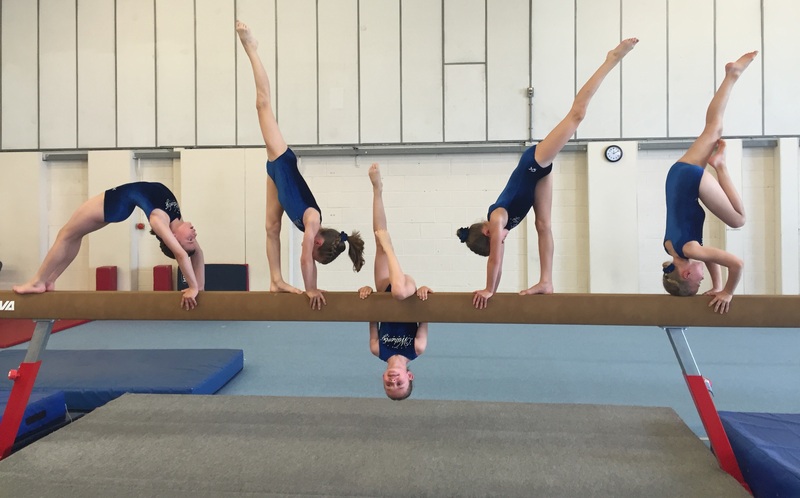 Ellie had waited the whole weekend to compete and started on the beam, nerves got the better of her. With a disappointing start to her competition Ellie had a choice, to give up and be beaten or fight her way back. Ellie showed such strength of character and belief in herself. Shoulders back, head up, I’m a Wetherby gymnast. Ellie placed 6th on Bars, 10th on Floor, 3rd on conditioning. Achieving 7th placed overall, narrowly missing a ribbon position. I would like to thank Sharon Parrett and Nichola Wood for judging 284 bar routines over 16 different competitions. 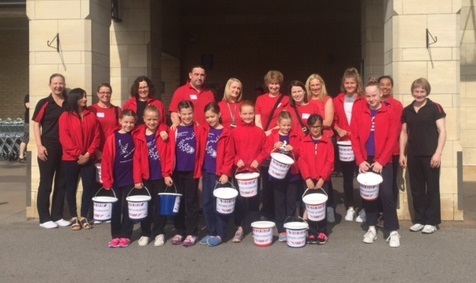 Such dedication to our club and gymnastics. I would like to say a huge thank you to Mrs Nobbs who once again went above and beyond in her role as competition manager. Taking care of 284 gymnasts, 70 judges, two lorries full of equipment, Milano, DE photos, GymData and goodness knows how many coaches and spectators. Your amazing! The Beginners will return, raring to go! Tuesday the 12th September is the first beginners class of the Autumn term 2017. I hope all the children had a great summer holiday, and practiced safely!! For those joining us for their first session, expect an evening packed full of knowledge and fun! If you want to be part of it, it’s not too late! Just get in touch using the contacts page. Naomi performed her first squat on to catch the high bar and roundoff flic. Emilia placed 8th on Bars and stuck her cartwheel on beam without a wobble. Ellie performed her first squat on to catch the high bar and roundoff flic. 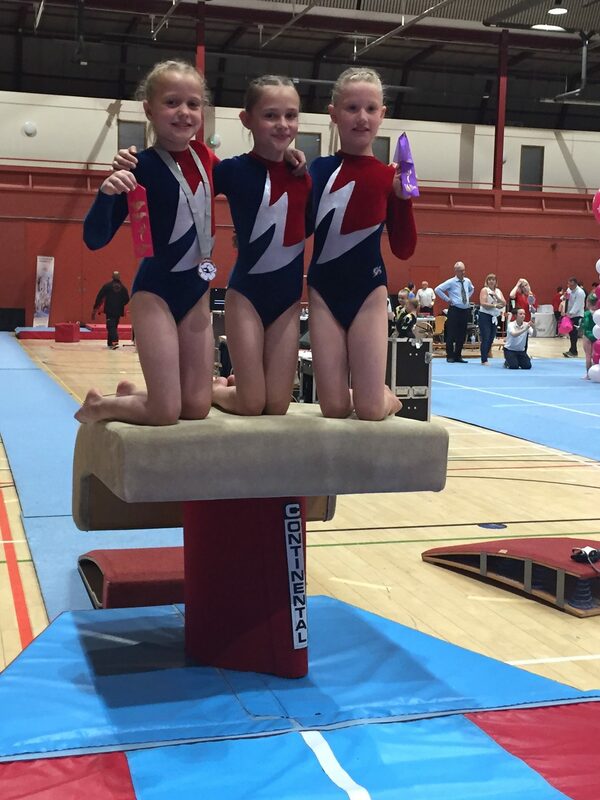 Tilly placed 1st on bars, 3rd on beam and 2nd overall. Emily placed 8th on bars and performed a strong roundoff flic. Evie placed 5th on beam, 6th on floor and 6th overall. Libby Bailey performed her recently learnt upstart squat on. Libby Cree placed 3rd on floor and 4th overall. 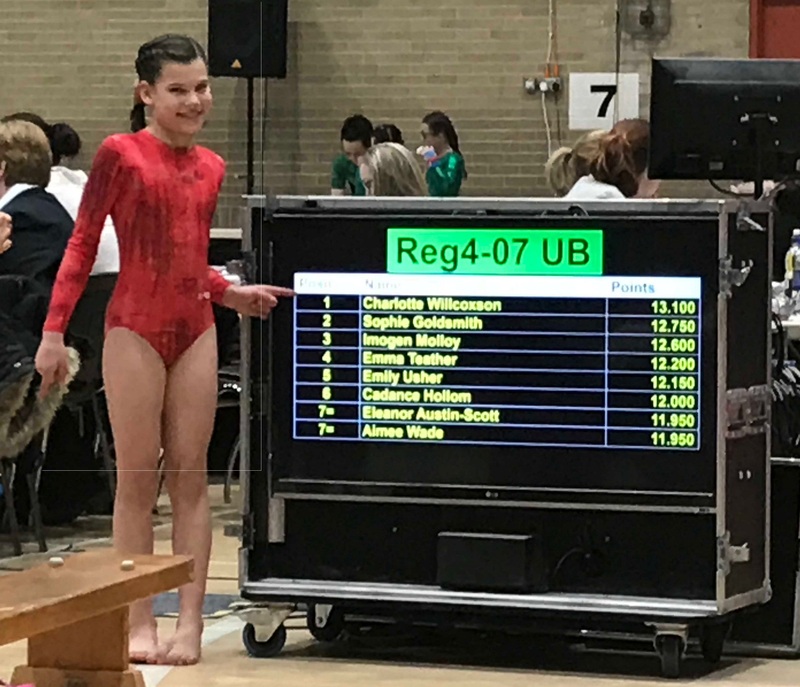 Sophie stuck her beam and received a strong floor score. 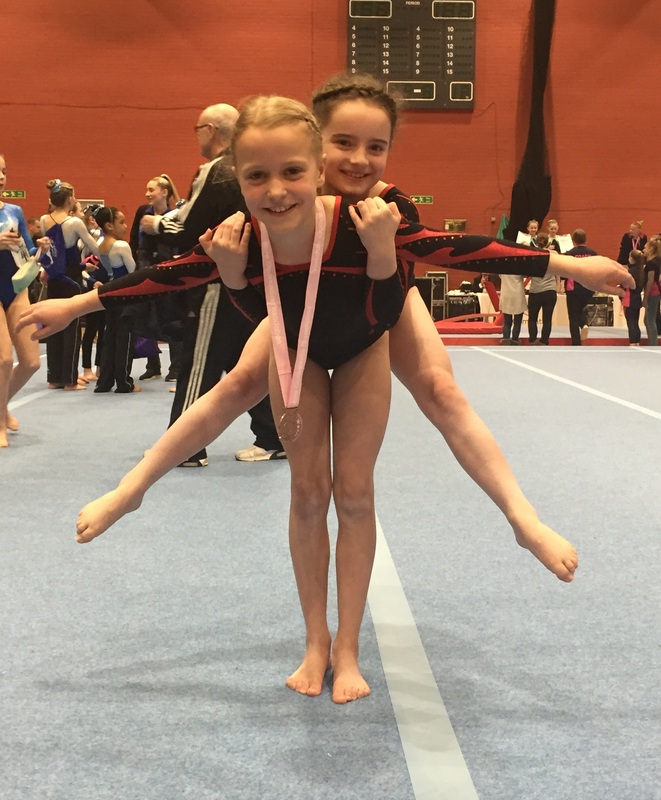 Charlotte overcame her worries from previous competitions to perform a strong bar routine. Emily fought incredibly hard to stay on the beam and despite wobbling in every direction, refused to fall off. Excellent attitude! Grace placed 4th on bars and 9th overall. 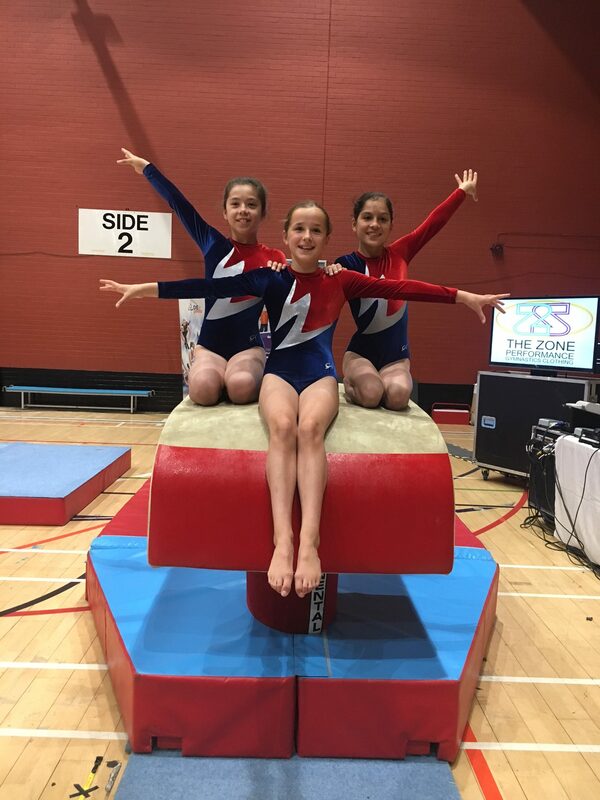 Anya performed somersaults on floor, lever to handstand mount, back flick on beam, upstarts on bars all for the first time. Eleanor placed 6th on floor with a new floor routine, 4th overall and a superb 1st on Beam. So much competition experience gained! Mia placed 3rd on bars, 2nd on beam, and 1st overall. Lucy placed 2nd on vault, 2nd on bars, 3rd on beam and 1st overall. Congratulations Nichola, on your champion coaching! Harriet placed 4th on Floor. 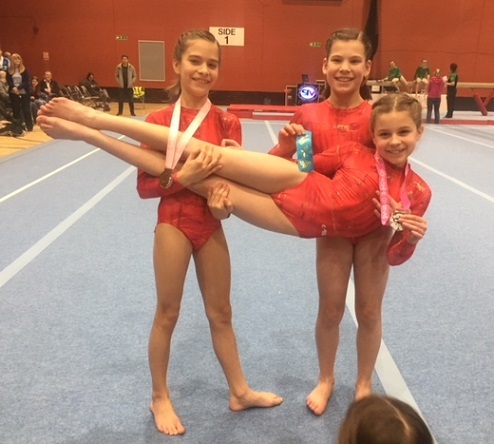 Anna placed 3rd on bars and was one of only two gymnasts in the competition to stick her forward roll on beam, well done! Sophie placed 1st on bars and 5th overall. A good day in the office! 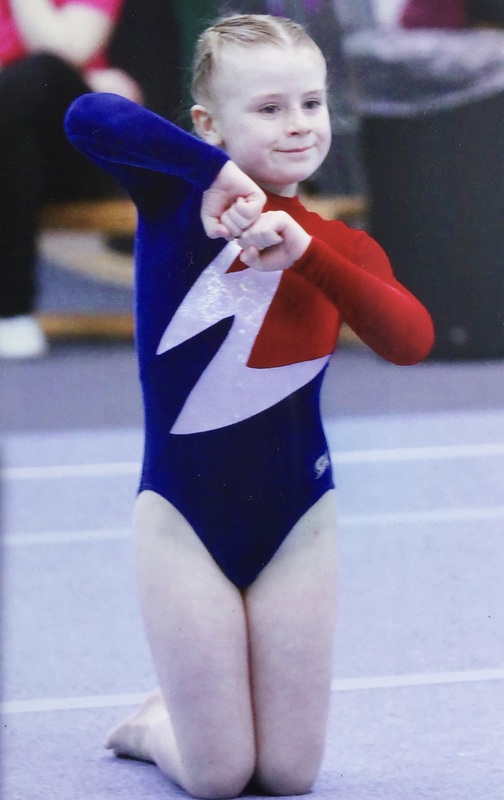 Charlotte placed 3rd on Beam and now believes that she can do beam, the coaches have known it for a long time! Emily Usher placed 6th on Vault and performed her first upstarts on bars. Libby Cree placed 6th on Bars and performed a strong front somi beam dismount. 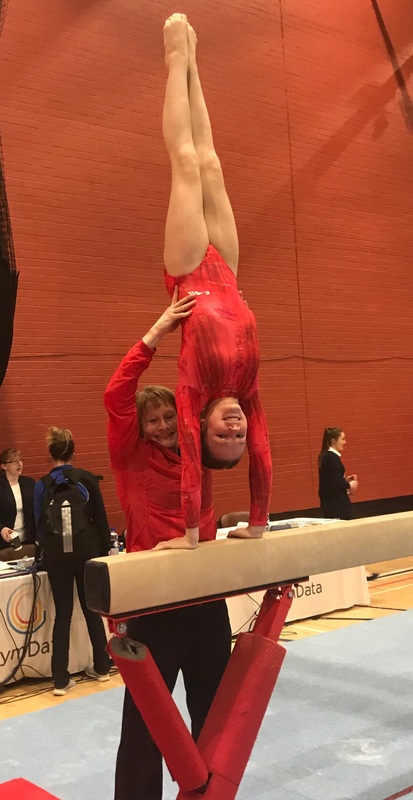 Libby Bailey performed a sky high tuck somi on floor and stuck her backwalkover on beam. 24 coaches, 47 gymnasts from across the region working together. Sharing knowledge, passion and inspiring one another to work hard, learn and achieve. 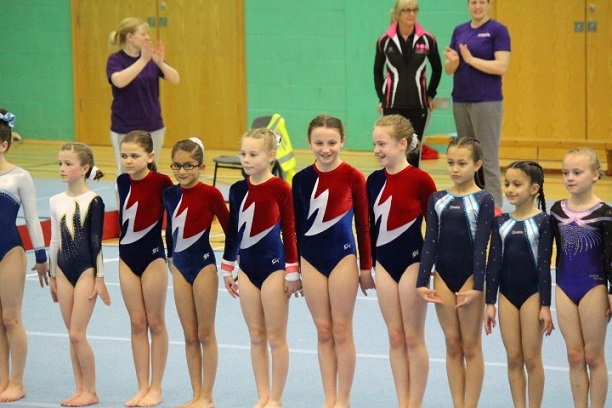 The Wetherby coaching team selected 6 gymnasts to attend. 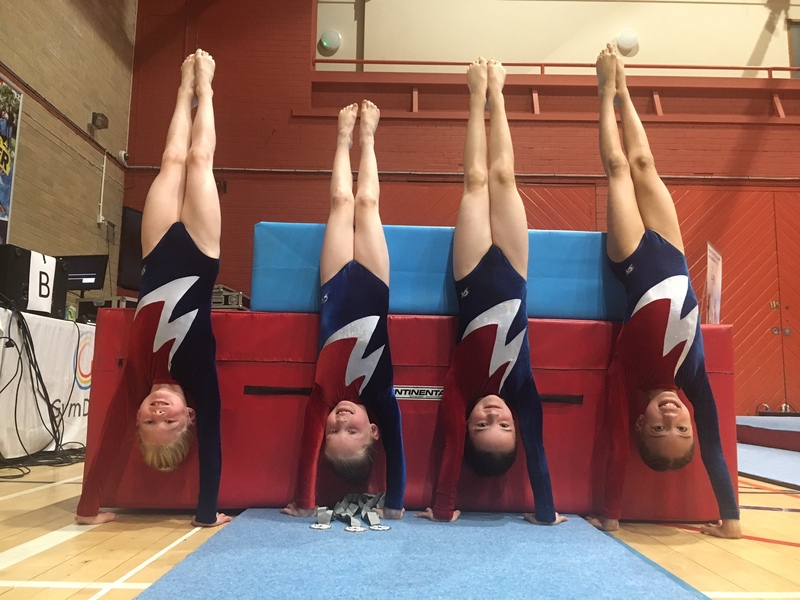 They learnt new preps for upstarts, worked hard on ballet and conditioning and practiced their floor routines. Thank you to Mrs N, Sharon and Emily for bringing their ideas to such a positive Yorkshire gathering. 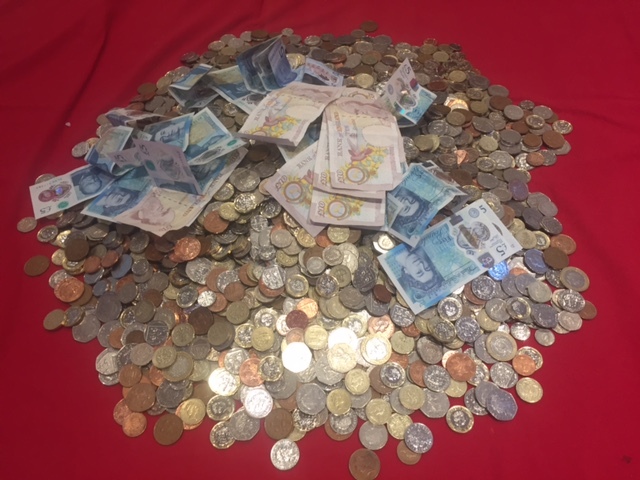 … and an unbelievable final total raised of £1561. A wonderful team spirit prevailed and too many compliments to mention on our wonderfully behaved, polite and hard working girls. Morrisons thought we did such a fantastic job they have invited us back again and agreed to display our giant banner outside the store. 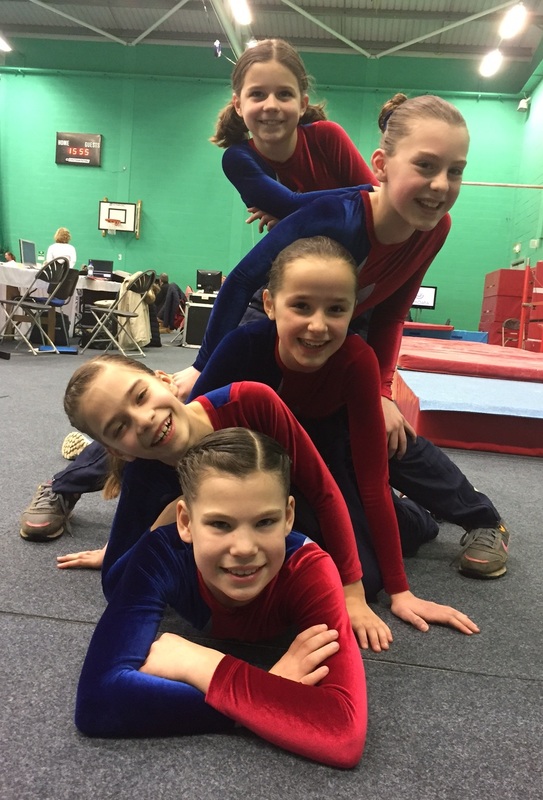 This is a reflection of the character and behaviour of our gymnasts. 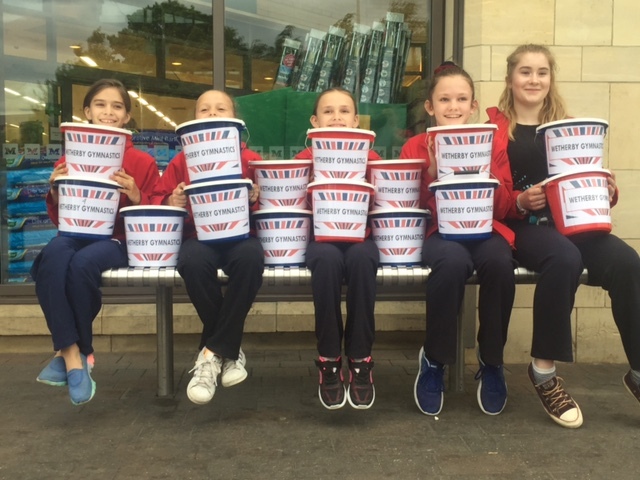 An enormous thanks to all who took part and supported us on a sunny Bank Holiday weekend, including the helpful & welcoming staff of Morrisons and, of course, not forgetting a huge thanks to the incredibly generous folks of Wetherby. We also created a lot of interest in the Club and are looking forward to welcoming a number of girls for taster sessions on the beginners class. 100% Distinction for Wetherby Girls! Ellie 5th overall, 3rd on beam. Holly 13th overall, 2nd on vault. Libby 7th overall, 5th on vault. Matilda 15th overall, 1st on vault. Naomi 12th overall, 5th on floor. Emilia placed 18th overall. Sophie 2nd overall, 1st on beam. Emily U 3rd overall, 1st on vault. Angel 4th overall, 3rd on conditioning. Charlotte 5th overall, 4th on bars. Emily T 8th overall, 1st on bars. 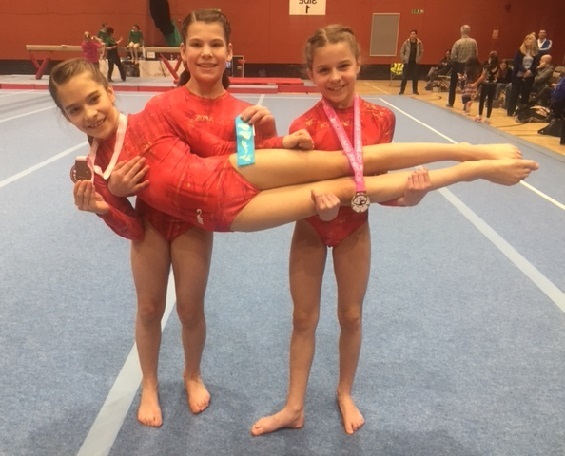 Evie – 11th overall, 4th on vault. Many Thanks to Mrs Nobbs and Sharon Parrett for Judging.